We manufacture high quality tailor-made jewel according to our clients’ wishes here at home in Hungary! The exact precise price is always determined by the complexity of the job and the number of hours worked. The wedding or engagement rings, depending on the complexity of the work, usually start at 16,000 HUF per 14 karat gold per gram. From 18 karat gold from 18,000 HUF/ gram. In the case of palladium white gold, the weight is approx. 10% more, the price starts at 20,000 HUF / g for 14 karat gold. may go up to 20 grams, depending on your finger size and the width of your chosen rings. The 18 karat gold's specific gravity is greater than that of 14 karat. The weight of the same jewel made of 18-karat gold is approx. 25-30% greater than the14 karat's. More types/styles can be freely varied and combined. A pair of steel rings /alloy rings (two pieces) start from 90,000 HUF; the titanium (“titan”) ring pair starts from 140,000 HUF regardless of size or weight. 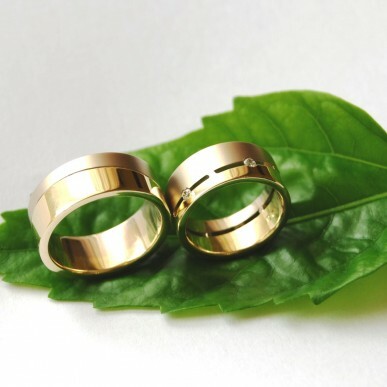 Two pieces of the gold-plated steel rings cost 150-200,000 HUF; it depends on the size of the finger and the width of the ring. The cost of a pair of damask steal rings is 190,000 Ft regardless of the weight. The price of platinum jewelry is very difficult or impossible to convert into price per gram. Its value always depends on the amount of time / work invested and the amount of material used. The HUF/gram of platinum rings, wedding or engagement rings depends on the complexity of the work; it usually starts from 30,000 HUF. The engagement rings are often only 2-3-4 grams. Depending on the complexity of the work, and on the stone or stones, they start from 70,000 HUF. Any figure, text or pattern on the outer and inner surfaces of jewels can be engraved or marred. The price of engraving is 1000 HUF per character; however, in case of breakthrough the price is higher for sandwich rings. Any font/type of letter can be applied that Word knows. Inside the rings even our loved one's fingerprint can be engraved for 25,000 HUF per ring. It is important to know the lady's finger size in case of engagement ring; without this information the finished ring will be either too large or too small. In addition, if gems are added to the ring; for high-gloss zircons- depending on the size-the price ranges from 2,000 to-5,000 HUF and the gem/gems are chased. Top Wesselton vvs1, high quality diamonds, depending on size, are available at a price of 14,000 HUF / pcs, chased and coming with a Certificate. We can carry out work based on photo provided by our client or previous work we have done. Every jewel will be a unique piece! The hand-made/custom-made rings are ready in one or three weeks from the time of the order for trial and within one or two additional weeks from the trial, they will reach their final shape. At least one and a half months are required for the preparation/creation of platinum rings and palladium-alloy white gold jewelry. Jewelry can be ordered personally at in our workshop with a minimum of 20% deposit. The price includes the material, the price of labor, the Hungarian or EU badge, and the ring boxes that are made of wood. The gems are provided with a Certificate. We guarantee our jewels! All our jewels are made by applying a unique traditional, hand-forged technology, carried out in high quality. Our jewels are unique and personalized and more durable than the molded jewels that are made in mass production. For any other information, please contact our goldsmith workshop at 1238. Budapest, Láng Endre utca 45. Appointment is necessary.